A documented pursuit for gear, equipment, and adventure. An ABC watch is a wrist-worn timepiece that doubles as a science vessel. It has the ability to calculate (read: estimate) the altitude, barometric pressure, and compass headings at the watch’s location. It’s the perfect combination for an outdoorsy geek, like myself. In November, after some ABC research, I decided to buy into the unique product category by purchasing the Casio PAW5000-1. Since I received it, it has been my companion on everything from jogs through the desert mountains, to Canadian snowboarding in freezing temperatures. In my time with the 5000, I’ve learned a lot about it, and even more about ABCs in general. 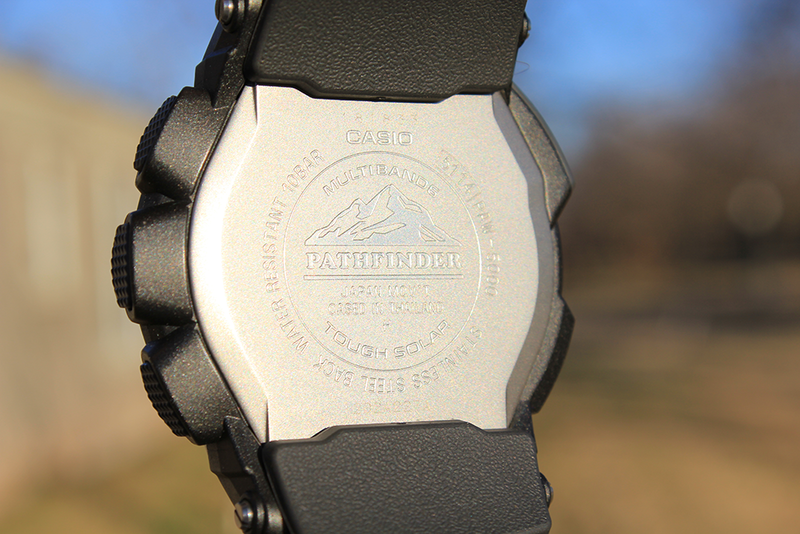 This is the Research, Receipt, and Review of the Casio Pathfinder PAW5000-1. The RigCast research on ABC watches can be referenced in depth, here. In an abbreviated format, my research found that ABC watches are awesome instruments, but not accurate ones. If you are planning on getting an ABC watch you should not plan on replacing anything else in your kit with it. It is not to be used as an A, B, or C without prior knowledge and understanding that the measurements are rough estimates and nothing more. They shouldn’t be used as topographic mapping instruments no more than they should be used as a paragliding altimeter. Once you have accepted the limitations of such a tool, you can move on to the benefits of having this capability strapped to your wrist. In my research, I was torn between the Casio and Suunto lineups. The Casios are more practical, while the Suuntos provide more accurate readings. Obviously, I ended up giving my money to Casio. 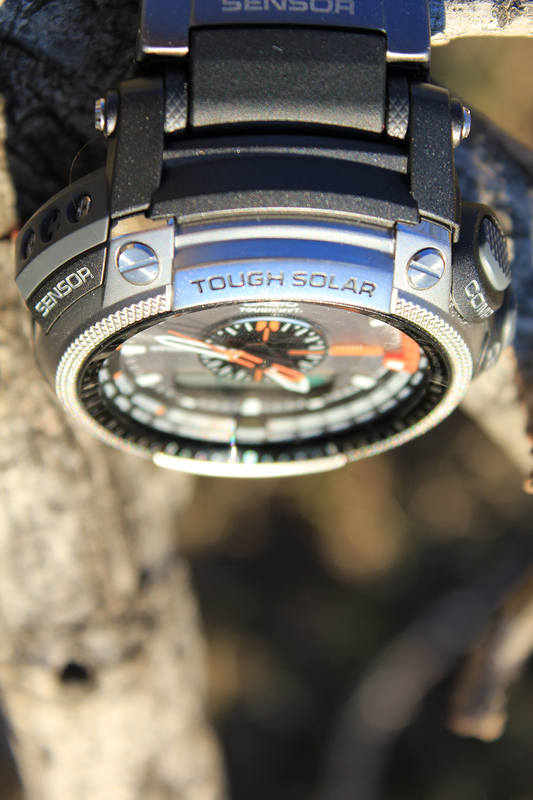 The main reason I chose the Casio is because they are charged by solar energy, so there is no need to replace the batteries. While changing watch batteries every 6-8 months might not be a burden for some, I am one of those people who has enough toys, mechanics, and electronics to maintain on a weekly basis. The less oil, money, attention, and maintenance a new piece of kit needs, the more valuable it becomes to me. Secondly, the Casio features synchronization with Atomic clocks signals, while Suunto omits this feature from their lineup. Yes, modern watches are very accurate and may only lose/gain 20 seconds every month, but that’s just one more thing I don’t have to maintain in my watch, so another value point to the Casio. All things considered, I will probably end up with a Suunto at some point in the future. Having the ability to lock your altimeter or barometer makes the Suunto far more accurate than the Casio, but I had to pick one first and the Casio met my requirements better than the Suunto options at the time. 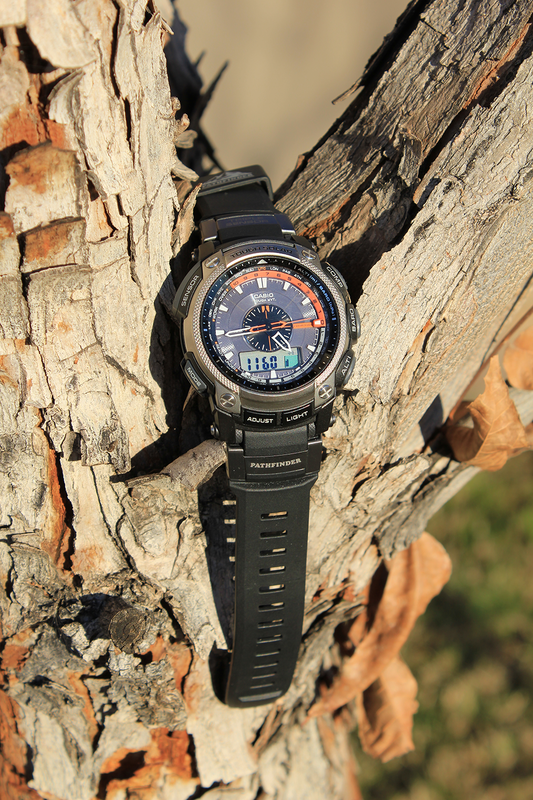 The Casio PAW5000-1 will consistently run you around $300 and up. In fact, I scored mine during a Black Friday sale, and it was still $299.98. That price is still available from the retailer that I purchased mine through, CampMor. You won’t find it any cheaper anywhere else, trust me I was patient and kept an eagle eye on it for weeks. Not to mention CampMor is a great company, and I highly recommend them. If you like the PAW5000-1, but don’t have the need for atomic syncing or the analog “Tough Movement” that maintains the zeroing of the watch hands, then you should look at the PRG500-1. It is an international version built for those who aren’t within range of an atomic signal, and it will run around $50 cheaper than the 5000. The past few months with the 5000 have been a learning experience. This was my first ABC watch, and the instruction manual is thick, so I knew I had a bit of a learning curve ahead of me. Today, I’m thrilled about what the watch has to offer, and I’m also disappointed by a few things I didn’t expect. However, I think the most important thing to note is that I continue to wear it during all of my hikes, jogs, and outdoorsy adventures. It’s a great companion, it’s fun to play with, it’s very durable, and it clearly has a lot of love put into it. With that in mind, I would like to discuss some things about the watch that could be improved. First of all, the biggest complaint I have with the watch is that the altimeter relies on barometric pressure for 100% of its readings. You don’t have to be a meteorologist to know that changes in barometric pressure don’t always indicate altitude changes. You could be sitting at your desk while a storm starts to move in. Your ABC barometer will drop, and your altitude will be reflected on the watch as increasing, even if you sit there at your desk through the whole storm. I knew about this before I bought the watch, but I didn’t expect it to be as bad as I have experienced. Generally I will calibrate the watch’s altimeter to my home’s altitude, and regardless of whether I take it out and about, on a hike, or just leave it on a table at home, it will be 40-500 ft off in a matter of days. Before purchasing this watch, cruising the interwebs yielded testimonies of inaccuracies far less that 500ft off in a few days, so this took me by surprise. Sometimes the altimeter is very accurate, other times it is way off. You can rely on the PAW5000-1 altimeter about as much as you can predict the weather because they are directly related. The inconsistent altitude readings can be frustrating when they are 200+ feet off, so I generally only reference the watches altimeter when I have recently calibrated it. Ok, you get it, moving on. 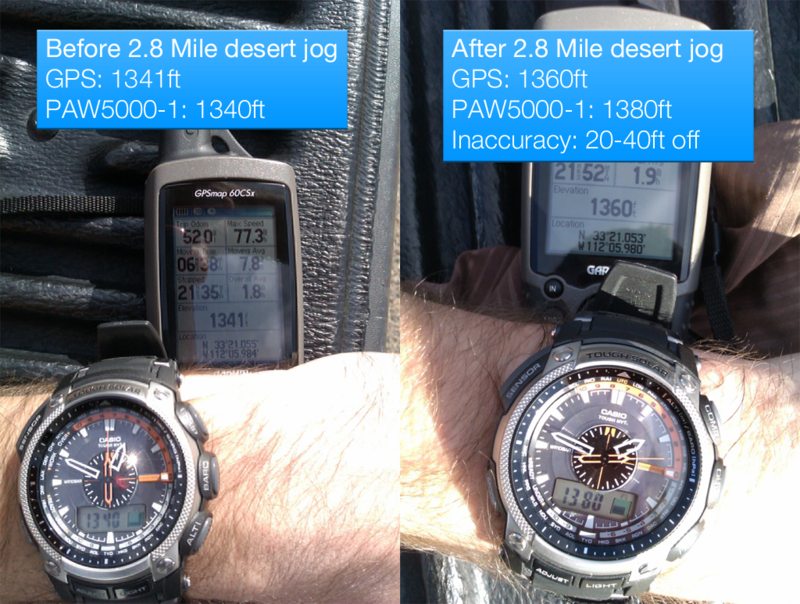 Beyond the altimeter, there’s a lot of things about the PAW5000-1 that I would recommend that Casio improve. These are not necessarily deal breakers as much as they are gripes, but they are important to note. For some people it might make the difference between a good product and an exceptional one. The countdown timer is limited to a maximum of 1 hr. I see no reason for this limitation. If the timer was increased to 24 hours, this feature would be infinitely more valuable. The watch only comes with a resin band. Although there are aftermarket options, it would be nice if there were cloth (or titanium) options right from the manufacturer. No lume. It would be nice if the watch had lume integrated so that it could be viewed at night without using the LED light. The new 5100 series has lume on the hands and dial, but it loses style and design with the lume filling in the hollow hands seen on the 5000. It would be ideal if Casio integrated the lume onto the analog hands and dial of the 5000, while keeping the skeleton hands and face style the same. Bad LCD lighting. The LED on the 5000 is right at the 6 o’clock position. When the LED light is turned on, it lights up the hands and the face of the watch wonderfully, while missing the recessed LCD screen almost completely. This could be solved by adding a backlit LCD. Limited ABC operation during LED usage. Lets say you are hiking at night, or even more realistically, nature is calling for you in the middle of the night. If you want to use your compass, or any ABC function at night, the light will freeze all ABC operations. Therefore, if you access the compass feature, turn on the light and spin around, the hand indicating north will be frozen until the LED turns off, at which time it will re-align itself with north but you won’t be able to see it until you turn on the light and freeze it again. 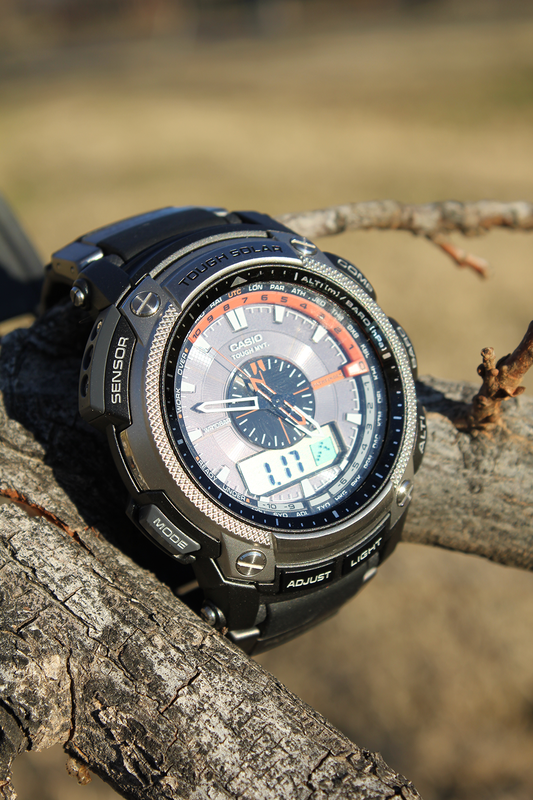 I understand Casio is probably trying to limit heavy battery loads, but a watch made for the outdoors shouldn’t be less functional just because it is dark. Short LED duration. The longest duration the LED can be set to remain on is 3 seconds. While that fulfills 90% of low-light needs, it would be nice if you could hold down the “light” button to keep the LED on as long as the user requires. The minute hand covers some part of the LCD for 25% of every hour. This is considered a universal flaw of most every digital-analog watch. Casio addressed this in the 2500 series, by putting two separate LCD screens on top of each other, but it lost the analog hands. I, however, prefer the look and feel of an analog watch, so I would propose elevating a small dual-LCD on the 5000 so that the analog hands move below the LCD screen, while the second LCD would provide an augmented hand on the screen imitating where the minute hand is pointing below the LCD. Alas, I’m a big dreamer. A simpler solution would be to include a function that temporarily moves the hands out of the way of the LCD while it is in use. It doesn’t correct air pressure for sea level. If you look up your local barometric pressure it will most likely be corrected for sea level, which means it is the pressure at your location, if you were at zero feet ASL. If you find the need to calibrate your barometer, its going to be a bit of work tracking down a weather station that provides the pressure at altitude, or converting it yourself. Atomic signal sync doesn’t work in the daytime. I can’t quite understand it, but the 5000 won’t sync to the atomic clock during the day, even if I am at altitude in a wide open space. At night, however, it syncs perfectly, even behind walls and a roof. Nothing really needs to improve with this because the sync performs reliably every night, but it is interesting to note. The “Adjust” buttons UI. In order to access or edit functions (like calibrating the altitude) you often need to hold the adjust button. Unfortunately, holding down the adjust button also performs a single press. For example, if you hold the adjust button on the home screen, it will first change the baro graph to the day (single press action), and then it will access the home menu (hold press action). If you are ever messing with menus or adjusting the altitude, you will find yourself constantly correcting the watch’s display because of this. The alarm is hardly audible. I would never rely on this watch to wake me up. The alarm is just far too quiet. This list is not intended to scare you away from the 5000, but instead to highlight some flaws so that you know where the limitations exist with this ABC. On the contrary, I still love this watch despite its shortcomings. In fact, of the things listed above the only ones that have even affected my experience negatively have been the altitude variances and #10. All the other things are hardly noticeable, or don’t interfere with operations at all. The resin band that comes on the 5000 is actually more comfortable than expected. It is a very soft resin, that can actually make it quite comfortable to wear the watch for long periods of time. Often enough, I have actually forgotten I was wearing it. Although I prefer the feel of a cloth band, especially the Maratac Zulu, it’s nice not having to worry about the smell that develops on a comfortable cloth band, or the wear that develops on a titanium band. The size of the watch is amazing. ABC watches are traditionally very large, to the point that I like to call them “hockey pucks.” The 5000 is still a rather large watch, too large to fit under my motorcycle gloves, but compared to most ABCs it is very slim and will look good even on smaller wrist sizes. The watch is very easy to read, even at a glance. ABC functions are simple and straightforward. 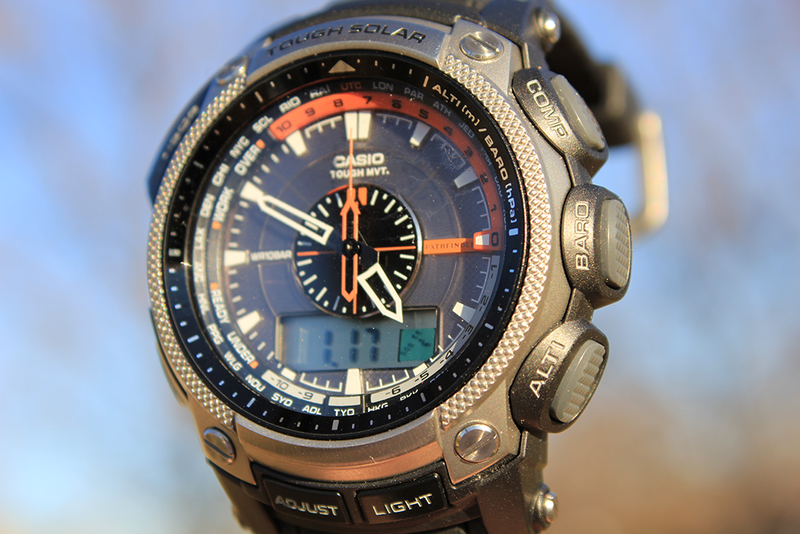 Casio did a great job marrying the analog hands with the digital functionality. The LCD screen does get covered up by the minute hand, but it is easy to assume what is on the LCD or turn your wrist slightly to see under the minute hand. I thought the skeleton hands would make it easier to read the LCD, but I never actually look through the hands, as looking around them is much more intuitive. Although I have my gripes with the altimeter, the barometer and compass are fairly accurate. They both perform consistently, and provide very meaningful data. I’ve noticed that the compass is accurate within 10 degrees or so. Often times it will point different directions, but they all generalize a northern heading reliably. The declination capability and functionality of the tool make it very useful. I’ve used the compass several times in foreign cities and countries when I am disoriented at night. The barometer is a fun little tool to play with. When the graph is going down, some sort of weather is usually on the way. When the graph is going up, the weather is most likely going to stabilize. Learning what the barometer translates to with the weather has been a fun experience, and as a daily motorcycle rider I appreciate getting a little fore-warning from my wrist about a large system moving in that I can’t see. 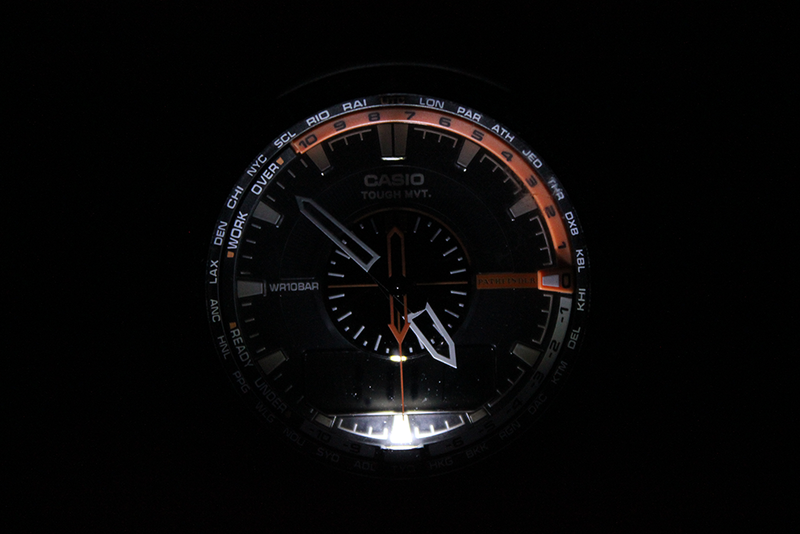 The watch is very stylish, and Casio definitely fulfills my personal fit and finish requirements. Everything on the display is beautiful, with just the right amount of asymmetry. If you aren’t a fan of the gray and orange, there is a blue and dark gray version available, a gray and yellow version for Europe, and an elusive all black version which is extremely rare and expensive. I prefer the one I received, as it has just the right amount of colored contrast to be useful, without looking too over done. The orange colors you see are actually very useful, as they represent the change in altitude or pressure based on a previous reading. The solar capability is amazing. Being one of the most important features for me, I had high expectations for it. I’m happy to report that the only time the watch has indicated a medium charge, was when I first received it. Who knows how long it was sitting in that dark casket before I cracked it open to revive it. A few hours in the sunlight and the watch hasn’t dropped below a high charge the entire time I’ve used it. It’s important to remember that this watch is just that, a timepiece. While it does offer a lot of bells and whistles, its most valuable asset to you should be keeping faithful, accurate time. In that regard, the PAW5000-1 is first class. I have never had a problem with it syncing at night, and I really appreciate knowing that the watch is self-calibrating the hands every hour with “Tough Movement,” so I can spend less time worrying about the little things. Bottom line, this is one hell of a watch with an impressive list of bells and whistles. It is the perfect supplemental companion for an adventurer, especially if they are bad at keeping track of what day it is. I love my PAW5000-1 and will continue using it for all my outdoor activities, in conjunction with a topographic map of course.